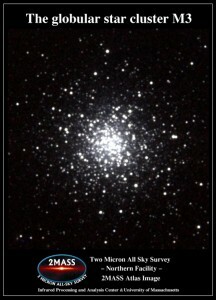 Messier 3 is one of the brightest, largest globular clusters in the sky. It has an apparent magnitude of 6.2 and is approximately 33,900 light years distant from Earth. It has the designation NGC 5272 in the New General Catalogue. 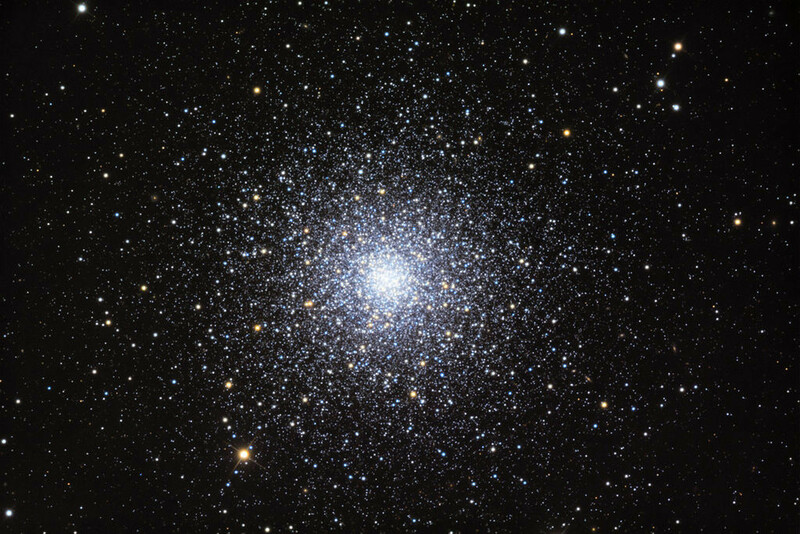 Messier 3 is one of the most popular targets among amateur astronomers next to Messier 13, the Hercules Globular Cluster, and one of the most studied of all known globular clusters. It has an absolute magnitude of about -8.93 and a luminosity about 300,000 times that of the Sun. The cluster is approaching us at 147.6 km/s. M3 contains an estimated half a million stars. The brightest stars in the cluster are of magnitude 12.7 and the average brightness of the 25 brightest stars is 14.23 mag. 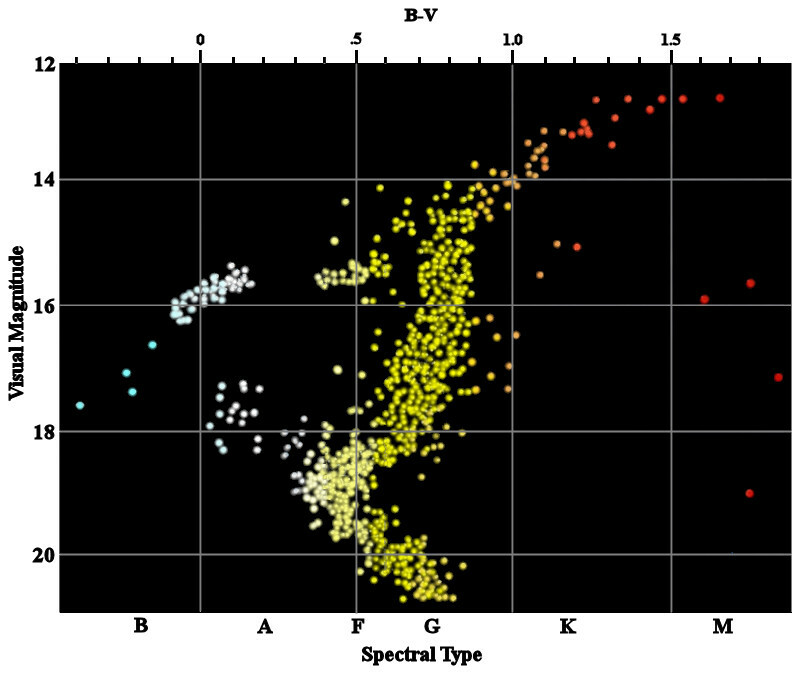 The overall spectral type of M3 is F2. The cluster has a total mass of about 450,000 solar masses. 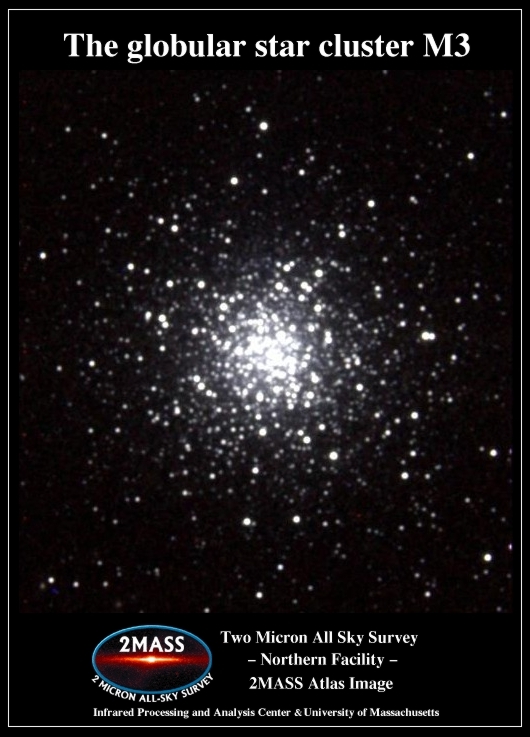 With a visual magnitude of 6.2, Messier 3 is difficult (but not impossible) to see without binoculars even in good viewing conditions, but the cluster appears fully defined in a moderate-sized telescope. A 4-inch telescope will reveal the bright core without resolving individual stars. A 6-inch instrument will resolve some of the outer stars, while an 8-inch telescope will reveal the stars everywhere in the cluster except in the bright core region. The central region of M3 can only be resolved into stars by larger instruments, starting with telescopes with a 12-inch aperture. 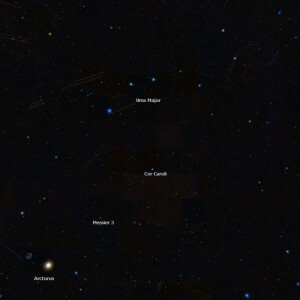 Messier 3 can be found halfway from the bright star Arcturus in Boötes constellation to Cor Caroli in Canes Venatici. 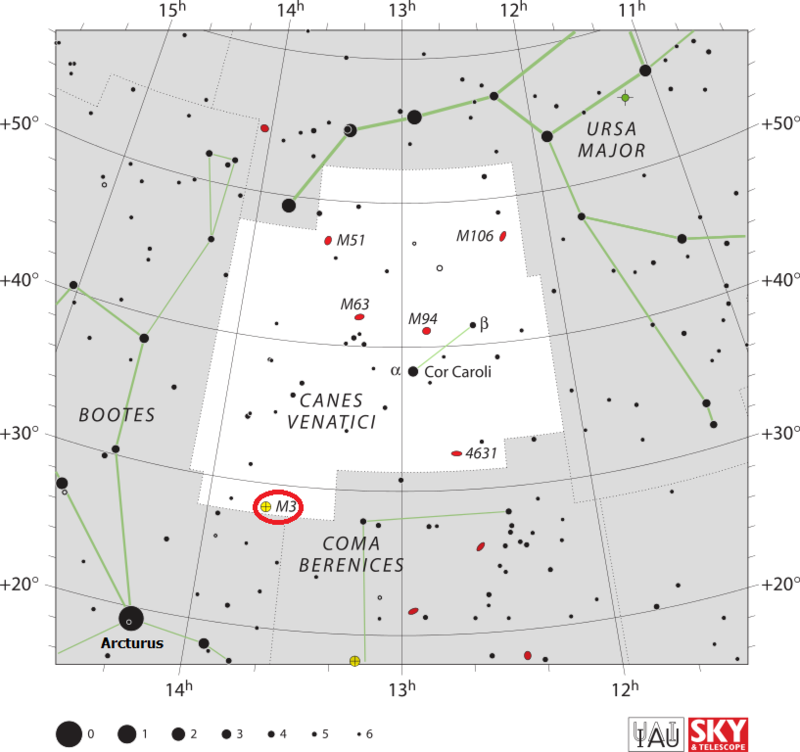 It lies about 6 degrees north-northeast of Beta Comae Berenices, near the border between the constellations Canes Venatici and Boötes. 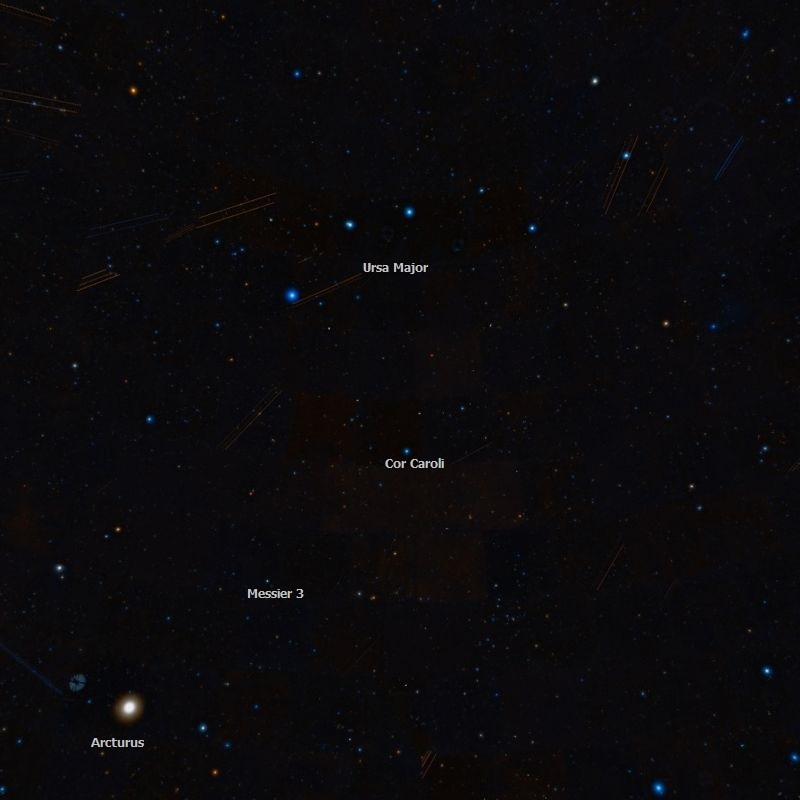 The best time of year to observe the cluster from northern latitudes is during the months of March, April and May. Messier 3. Image: Two Micron All Sky Survey (2MASS), a joint project of the University of Massachusetts and the Infrared Processing and Analysis Center/California Institute of Technology, funded by the National Aeronautics and Space Administration and the National Science Foundation. Messier 3 is one of the 250 or so known globular clusters in the Milky Way Galaxy. The cluster lies 38,800 light years or 11,900 parsecs from the galactic centre and 31,600 light years or 9,700 parsecs above the plane of the Milky Way, in the galaxy’s halo. When observed from Earth, the cluster lies in the direction of intergalactic space, opposite to the galactic centre. The dense core of M3 measures 1.1′ in diameter, corresponding to 11 light years, while the entire cluster spans about 180 light years, corresponding to an apparent diameter of 18 arc minutes. Messier 3 is believed to be between 8 and 11.4 billion years old. It contains mostly old, red stars. The cluster is also home to an unusually large number of variable stars. The first variable star in the cluster was discovered by the American astronomer and physicist Edward Charles Pickering in 1889. The American astronomer Solon Irving Bailey identified the next 87 in 1895 and another 138 by 1913. New variable stars continue to be discovered in the cluster to this day. Currently there are 274 known variables identified in M3, which is more than in any other known globular cluster. Of these, at least 170 stars are RR Lyrae variables. Messier 3 also contains a relatively high number of blue stragglers, blue main-sequence stars that appear to be young and are bluer and more luminous than other stars in the cluster. These stars are now believed to form as a result of stellar interactions. 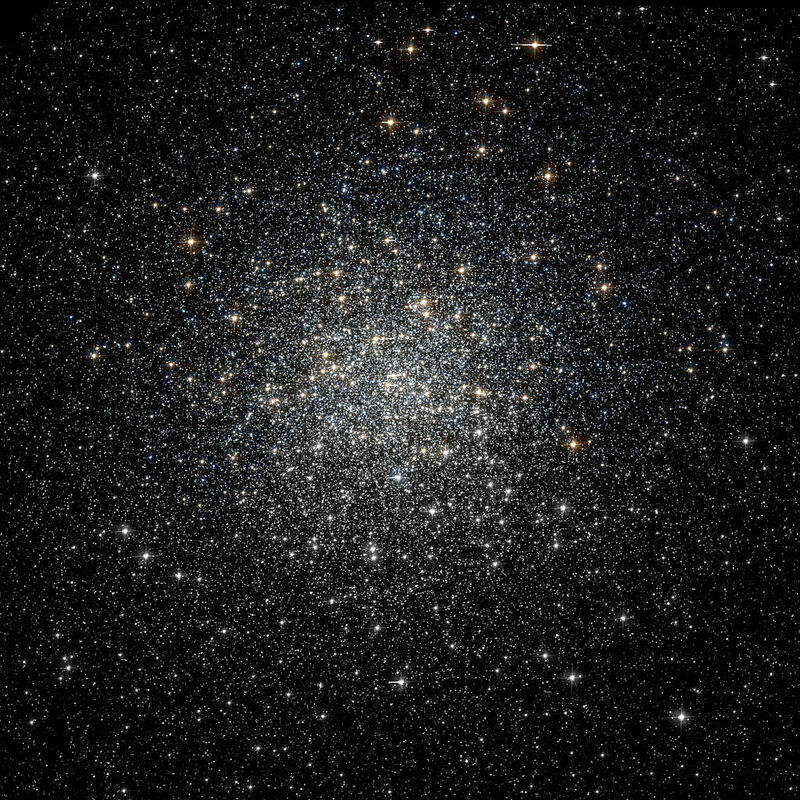 Messier 3 is the prototype for the Oosterhoff type I cluster, which is to say a metal-rich globular cluster (relatively speaking), or one with a high abundance of elements other than hydrogen and helium compared to other globular clusters. Messier 3. Image based on observations made with the NASA/ESA Hubble Space Telescope, and obtained from the Hubble Legacy Archive, which is a collaboration between the Space Telescope Science Institute (STScI/NASA), the Space Telescope European Coordinating Facility (ST-ECF/ESA) and the Canadian Astronomy Data Centre (CADC/NRC/CSA). 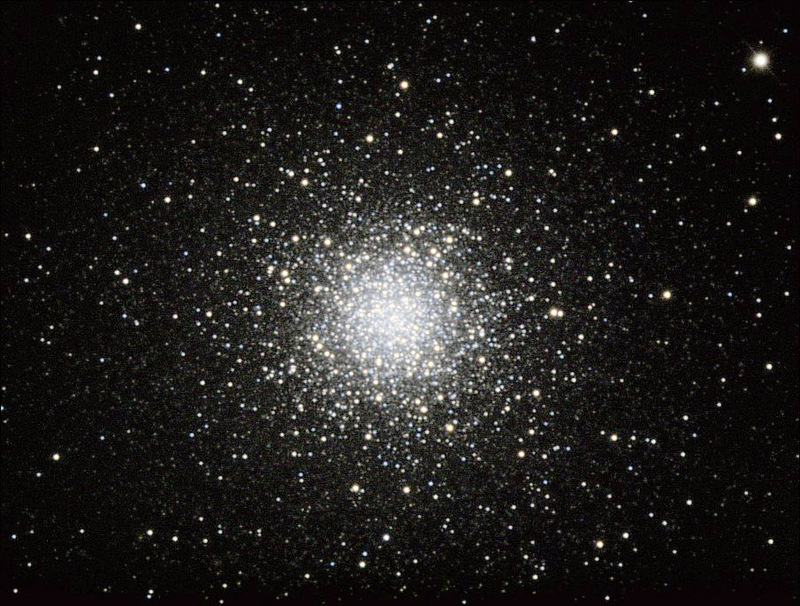 Image of globular cluster M3 taken by Robert J. Vanderbei.